Exeter. Eland, Henry Septimus. 1855. Printer. Mills, Barton R.V. The early sieges of Exeter and their connexion with the general history of England / by the Rev.Barton R.V.Mills. - Exeter : Henry S.Eland , 1855. - 22p ; 22cm. - Held by: Devon Heritage Centre: B/EXE/355.44/MIL. - Subjects: Devon. Exeter. Sieges. Exeter. Eland, Henry Septimus. 1869. Printer. Pridham, T.L. Devonshire celebrities / by T.L.Pridham. - Exeter : Henry S.Eland , 1869. - ,236p,plates : ports ; 21cm. - Portraits are mounted photographs. - Held by: Devon Heritage Centre: 920.02/DEV/PRI ; Barnstaple: 920.02/B/PRI ; North Devon Athenaeum: D920/PRI ; British Library ; Senate House Libraries, University of London ; University of Cambridge Libraries ; University of Leicester Library ; University of Exeter Libraries ; University of Oxford Libraries. - Subjects: Devon. Biographies. Collections. Exeter. Eland, Henry Septimus. 1869. Printer. Trower, W. I. 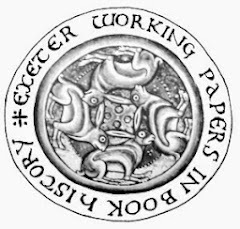 A charge delivered to the clergy and churchwardens of the diocese of Exeter / by W.I. [sic] Trower. - Exeter Eland 1869. - 23p ; 22cm. - Held by: National Library of Scotland ; University of Cambridge Libraries. Exeter. Eland, Henry Septimus. 1869. Printer. Boyd, Archibald. The Book of Common Prayer : a lecture / by Archibald Boyd. - Exeter Eland 1869. - 27, p. ; octavo. - Lecture delivered to members of the Exeter YMCA. - Held by: Lambeth Palace Library ; University of Cambridge Libraries. Exeter. Eland, Henry Septimus. 1869. Printer. Ordination Sermons, preached in the Diocese of Exeter, by A. C. Thynne, F. C. Cook, G. C. Harris, R. H. Barnes, J. Hewett, J. M. Cox, P. L. D. Acland. W. R. Clark, 1865 to 1868. Published by command of Henry, ... Bishop of Exeter. - London ; Exeter [printed] : Elands , 1869. - 8º. - Held by: University of Cambridge Libraries ; University of Exeter Libraries ; British Library. Exeter. Eland, Henry Septimus. 1870. Printer. Sweet, J. B. Studies for the baptised preparatory to confirmation or at other times / by J. B. Sweet. No. 1. - [Exeter] [Henry S. Eland] [1870?]. - 8p ; 19cm. - Held by: University of Cambridge Libraries (Special Collections). Exeter. Eland, Henry Septimus. 1870. Printer. Sweet, J. B. Studies for the baptised preparatory to confirmation or at other times / by J. B. Sweet. No. 2. - [Exeter] [Henry S. Eland] [1870?]. - 8p ; 19cm. - Held by: University of Cambridge Libraries (Special Collections). Exeter. Eland, Henry Septimus. 1870. Printer. Sweet, J. B. Studies for the baptised preparatory to confirmation or at other times / by J. B. Sweet. No. 3. - [Exeter] [Henry S. Eland] [1870?]. - 12p ; 19cm. - Held by: University of Cambridge Libraries (Special Collections). Exeter. Eland, Henry Septimus. 1870. Printer. Scott, W. R. The deaf and dumb : their education and social position / by W.R. Scott. - 2nd. ed. - London Exeter Bell & Daldy H. S. Eland 1870. - viii, 265 pages ; 22 cm. - Held by: University of Bristol Libraries ; University of Manchester Libraries ; Wellcome Library. Exeter. Eland, Henry Septimus. 1871. Printer. Bell, T.P. An elegy on the death of the good Sir T.D.Acland, Bart., of Killerton Park, Devon, born March 1787, died July 1871. - Exeter : Henry S.Eland , 1871. - 7p ; 21cm. - Held by: Devon Heritage Centre: s080/DEV/TRA/02 06. - Subjects: Devon. Broadclyst. Poetry. Bell, T.P. Texts. Exeter. Eland, Henry Septimus. 1871. Printer. Dynham, W.H. Memoria technica applied to history geography and mathematics - 2nd edition. - Exeter : Eland , 1871. - 40p ; 20cm. - Held by: Devon Heritage Centre: s153.14/GEN/DYN. - Subjects: Background. Memory. Mnemonic systems. Exeter. Eland, Henry Septimus. 1871. Printer. Radford, William Tucker Arundel. Remarks on the restoration of our cathedral : a letter to George Gilbert Scott Esq. / by W.T.A.Radford. - Exeter : Henry S.Eland , . - 32p ; 21cm. - Held by: Devon Heritage Centre: psB/EXE/726.6/RAD ; Society of Antiquaries of London Library ; University of Cambridge Libraries ; University of Exeter Libraries ; University of Manchester Libraries ; University of Oxford Libraries ; V&A Libraries ; National Library of Scotland ; British Library. - Subjects: Devon. Exeter. Cathedrals. Restoration. Exeter. Eland, Henry Septimus. 1871. Printer. Wyatt-Edgell, A. A collection of soldiers' songs / by A.Wyatt-Edgell. - Exeter : Henry S.Eland , 1871. - ,136p : ill, score ; 21cm. - Held by: Devon Heritage Centre: s784.71/GEN/WYA. - Subjects: Westcountry. Military songs. Exeter. Eland, Henry Septimus. 1871. Printer. Mills, Alfred W. The inner life as acting and re-acting on ourselves and others : being a paper read at the Cornwall Clergy Devotional Conference, May 3rd, 1871 / by Alfred W. Mills, M.A., vicar of St. Erth. - London Exeter Truro John Hodges H.S. Eland J.R. Netherton 1871. - 16 p. ; 17 cm. - Title from cover. "Published by request.". - Held by: University of Cambridge Libraries. Exeter. Eland, Henry Septimus. 1871. Printer. Lory, H. C. A Book for Naval Men, containing a few remarks on the sailor, the captain, chaplains, and midshipmen, by H. C. L. [i.e. H. C. Lory.]. - Exeter H. Eland 1871. - 41 p. ; 8º. - Held by: British Library. Exeter. Eland, Henry Septimus. 1871. Printer. Lyne, Charles. The true patriot : a sermon preached in the Parish Church of Dawlish, Dec. 18, 1870, in behalf of the Devonshire Church Institution / by the Rev. Charles Lyne. - Exeter ; London : Henry S. Eland Bell and Daldy 1871. - 46 p. ; 18 cm. - Title from cover. On Luke vii. 2-5. Includes bibliographical references. - Held by: University of Cambridge Libraries ; University of Oxford Libraries ; British Library. Exeter. Eland, Henry Septimus. 1871. Printer. Lee, Sackville. Voluntary schools v. rate-aided schools : a sermon preached in Exeter Cathedral, Sunday, 14th May, 1871, on behalf of the Devon and Exeter central schools / by Sackville Lee. - Exeter Henry S. Eland 1871. - 11 p. - Held by: University of Bristol Libraries ; British Library. Exeter. Eland, Henry Septimus. 1871. Printer. What style ought we to employ in additions to old work? : a paper read at the quarterly meeting of the Exeter Diocesan Architectural Society..., November 3, 1870. - Exeter Henry S.Eland 1871. - 18p ; 17cm. - Cover title. - Held by: University of Exeter Libraries ; Society of Antiquaries of London Library ; V&A Libraries. Exeter. Eland, Henry Septimus. 1872. Printer. Ingle, John. A letter to Rev. G.Porter, Rector of S.Leonard's / from John Ingle. - Exeter : Eland , 1872. - 34p ; 22cm. - Author was Rector of Saint Olave. - Held by: Devon Heritage Centre: s234.163/GEN/ING. - Subjects: Devon. Exexter. Clergy. Ingle, John. Works. Letters. 1872. Exeter. Eland, Henry Septimus. 1872. Printer. Pycroft, George. 1st Rifle Volunteers : Extracts from the Auxiliary and Reserve Forces Circular 28 May 1872 / George Pycroft. - Exeter : Henry S.Eland , . - 27p ; 20cm. - Held by: Devon Heritage Centre: p355.37/DEV/PYC. - Subjects: Devon. Army. First Volunteer Rifle Corps. Volunteers. 1852. Exeter. Eland, Henry Septimus. 1873. Printer. Freeman, Philip. The architectural history of Exeter cathedral / by Philip Freeman. - Exeter : Henry S.Eland , 1873. - viii,88p,pl : ill,plan ; 22cm. - URL: http://www.bookartworld.co.uk/viewsearch.asp?date=1873&sq=10. - Held by: Devon Heritage Centre: B/EXE/726.6/FRE ; North Devon Athenaeum: D900EXE/FRE ; British Library ; City of London, Guildhall Library ; National Library of Scotland ; The London Library ; Trinity College Dublin Library ; University of Cambridge Libraries ; University of Exeter Libraries ; University of Leicester Library (Special Collections) ; University of Oxford Libraries ; V&A Libraries ; University of Cambridge Libraries. - Subjects: Devon. Exeter. Cathedrals. Saint Peter. Architecture. Exeter. Eland, Henry Septimus. 1873. Printer. Ingle, John. A letter to his parishioners / from John Ingle - 2nd edition. - Exeter : Eland , 1873. - 67 ; 22cm. - Author was Rector of Saint Olave. - Held by: Devon Heritage Centre: sB/EXE/230.3/ING. - Subjects: Devon. Exexter. Clergy. Ingle, John. Works. Letters. 1873. Exeter. Eland, Henry Septimus. 1873. Printer. Hamilton, A. H. A. Ballads from Hebrew history / by A.H.A. Hamilton. - London Exeter Hamilton, Adams, & Co. Henry S. Eland 1873. - 72 p. ; 15 cm. - Without music. Contents: Joseph -- Moses -- Solomon -- Song of the palm-bearers -- Rest. - Held by: University of Cambridge Libraries. Exeter. Eland, Henry Septimus. 1873. Printer. Gidley, Lewis. Sir Dagonet : An idyl. [By Lewis Gidley]. - London Exeter Bell & Daldy Henry S. Eland . - pp.16 ; 8°. - Microfilm. London: British Library. 1 reel: negative; 35 mm. PB.Mic.23999. - Held by: British Library ; Register of Preservation Surrogates. Exeter. Eland, Henry Septimus. 1873. Printer. Kingdon, G. T. The "rock" and the "stone" : or Christ Himself, and not Saint Peter the main foundation as well as the chief corner-stone or centre of unity to the spiritual building, the Holy Catholic Church : two sermons preached at Nice, at Vevey, and at St.Thomas' near Launceston / by the Rev. G.T.Kingdon. - Exeter Henry S.Eland 1873. - 34p ; 20cm. - With preface. - Held by: Senate House Libraries, University of London ; National Library of Scotland ; University of Cambridge Libraries ; British Library. Exeter. Eland, Henry Septimus. 1874. Publisher. Observations on the character of Queen Elizabeth : originally published in the Exeter flying post. - Exeter H.S. Eland, printed by C.J. Bellerby 1874. - 40p. - Held by: University of Exeter Libraries. Exeter. Eland, Henry Septimus. 1875. Printer. Troyte, Charles A.W. Change ringing : an introduction to the early stages of the art of church or hand bell ringing for the use of beginners.- 4th ed. - Exeter : Henry S.Eland , [1875?]. - 190p,3 leaves of pla ; 18cm. - Held by: Devon Heritage Centre: s789.5/GEN/TRO. - Subjects: Westcountry. Bell-ringing. Exeter. Eland, Henry Septimus. 1876. Printer. Woollcombe, Henry. Notes for lectures on S. John's Gospel, chapters I-IV, delivered at the Athenaeum, Exeter, in the spring of 1876. - Exeter : H. S. Eland , 1876. - 66p ; 21cm. - Held by: Devon Heritage Centre: p226.5/GEN/WOO ; University of Exeter Libraries ; University of Bristol Libraries. - Subjects: Devon. Exeter. Learned societies. Exeter Athenaeum. Lectures. Gospels. 1876. Exeter. Eland, Henry Septimus. 1876. Printer. The Great Unacknowledged because Unseen Creator. Christ the revealed Creator, Redeemer and Judge ... Clericus Exoniensis, B.A., Cambridge, 1830. - London Exeter William Macintosh H. S. Eland 1876. - pp. xi. 215 ; (8vo). - Held by: British Library ; Trinity College Dublin Library. Exeter. Eland, Henry Septimus. 1877. Bookseller. Ormerod, G. Wareing. Archaeological memoirs relating to the east of Dartmoor : Historical sketch of the parish of Chagford. Rude stone remains. Traces of tin streaming in the parish of Chagford. Fall and restoration of the Drewsteignton cromlech, and description of stone circles and avenues formerly existing in its vicinity. Wayside crosses / by G. Wareing Ormerod, Esq., M. A., F. G. S. - Exeter Printed for the author, and to be obtained from H. S. Eland, High Street, Exeter [1877?]. - viii, 20, 18, 8, 8, 15 p.  p. of plates. ; 21 cm. - "Notice" on p. [iii] is dated November 1876. BM catalogue estimates publication date as 1877. Taken from: Transactions of the Devonshire Association. - Held by: British Museum Library ; Chetham's Library ; University of Exeter Libraries ; University of Leicester Library ; University of Oxford Libraries ; University of Cambridge Libraries ; Trinity College Dublin Library ; Society of Antiquaries of London Library. Exeter. Eland, Henry Septimus. 1878. Publisher. Fabellae mostellariae : or Devonshire and Wiltshire stories in verse including specimens of the Devonshire Dialect. - Exeter : Henry S. Eland , 1878. - 77p ; 20cm. - Held by: WSL : s398.2/WES/FAB ; Barnstaple: 821 /FAB ; North Devon Athenaeum: D821/FAB. - Subjects: Devon. Poetry. Exeter. Eland, Henry Septimus. 1881. Publisher. Pycroft, George. The origin of the volunteer movement of 1852 and the history of the First Volunteer Rifle Corps... / George Pycroft. - Exeter : Henry S.Eland , 1881. - 27p ; 20cm. - Held by: WSL : p355.37/DEV/PYC . - Subjects: Devon. Army. First Volunteer Rifle Corps. Volunteers. 1852. Exeter. Eland. 1886. Publisher. Gibbons, Maria S. We donkeys on Dartmoor.  . – Held by: Devon Heritage Centre: DAR 5/1886/GIB : sB/DAR 5/1886/GIB : B/DAR 5/1886/GIBr : BX:DAR 5/0001/GIB : D910DAR/GIB. Exeter. Eland. 1886. Publisher. Gibbons, Maria S. We donkeys in Devon. 1886. – Held by: Devon Heritage Centre: DEV/1886/GIB : DEV/1886/GIBr : B/1886/GIB. Exeter. Eland. 1886. Publisher. Volo non Valeo [Gibbons]. We donkeys in Devon. 1886. Not acquired WSL : Tiv VOL 89 : 2/GIB. Exeter. Eland. 1887. Publisher. Exeter Diocese. The marriage licences of the diocese of Exeter. 1887. – Held by: Devon Heritage Centre: 929.3/WES/1523 : s929.3/WES/1523 : 929.3/WES/1523 : 929.3253/A/EXE. Exeter. Eland. 1887. Publisher. The medieval kalendar of the Diocese of Exeter, adapted to the modern kalendar of the C of E. 1887. Exeter. Eland. 1888. Publisher. Freeman, Philip. The architectural history of Exeter Cathedral. 1888. – Held by: Devon Heritage Centre: B/EXE/726.6/FRE : B/EXE/726.6/FRE : sB/EXE/726.6/FRE : sB/EXE/726.6/FRE : sB/EXE/726.6/FRE : sB/EXE/726.6/FRE. Exeter. Eland. 1890. Publisher. Pasmore, W.S. Old stories of Devon and Cornwall.  . – Held by: Devon Heritage Centre: s828.99/PAS. Exeter. Eland. 1893. Publisher. Chudleigh, John. Devonshire antiquities. 1893. – Held by: Devon Heritage Centre: DEV/0005/CHU : sDEV/0005/CHU : DEV/0005/CHUr : B/0005/CHU : D571/CHU. Exeter. Eland. 1893. Publisher. The visitors' guide to Exmouth with map. [1893? . – Held by: Devon Heritage Centre: sB/EXM 7/1893/VIS. Exeter. Eland. 1894. Publisher. Bird Charles. [ South tower, Exeter Cathedral and part of Bishop's palace. 1894. – Held by: Devon Heritage Centre: O Pr. Exeter. Eland. 1894. Publisher. Boggis, Robert James Edmund. Exeter cathedral. 1894. – Held by: Devon Heritage Centre: B/EXE/726.6/BOG : sB/EXE/726.6/BOG : 726.6/BX:EXE/BOG. Exeter. Eland. 1895. Publisher. College of Arms. The visitations of the county of Devon, comprising the heralds' visitations of 1531, 1564 & 1620. 1895. – Held by: Devon Heritage Centre: sx929.3/DEV/1531 : sx929.3/DEV/1531r : 929.22 : 22/VIV/DEVON : 22/VIV/DEVON : D929/VIV. Exeter. Eland, Henry Septimus. 1895? Publisher. The resurrection morn, by Herbert Schmalz : a description of the picture / [Farrar, Frederic William.]. - Exeter Henry S. Eland [1895?]. - 14p. - Held by: University of Exeter Libraries. Exeter. Eland. 1900. Publisher. Cobleigh, Uncle Tom. Zum vunny Demshur tellins. [1900? . – Held by: Devon Heritage Centre: 828.99/COB : 828.99/COBr : 828.99/COB : D427/COB. Exeter. Eland. 1910. Publisher. Iddesleigh, Stafford Henry Northcote. Comedy and acrostics. 1---. – Held by: Devon Heritage Centre: s828/IDD. Exeter. Eland. 1910. Publisher. Vining, Frank Whitaker. Kenn. : our home. 1910. B/KEN 1/0001/VIN : B/KEN 1/0001/VIN. Exeter. Eland. 1913. Publisher. Iddesleigh, Stafford Henry Northcote. Anthology and acrostics. 1---. – Held by: Devon Heritage Centre: s828/IDD. Exeter. Eland. 1915. Publisher. Voluntary aid in Devon. 1915. – Held by: Devon Heritage Centre: s361.7/DEV/VOL. Exeter. Eland. 1919. Publisher. Quill, Quin. Through the Mesopotamian campaign with Pimpler and party.  . – Held by: Devon Heritage Centre: s828.99/QUI. Exeter. Eland. 1919. Publisher. Whetham, Catherine Durning. Occasional verses in wartime (second series). 1919. – Held by: Devon Heritage Centre: s821/WHE. Exeter. Eland. 1922. Publisher. Harris, John Delpratt. The Royal Devon and Exeter Hospital. 1922. – Held by: Devon Heritage Centre: B/EXE/362.1/HAR : sB/EXE/362.1/HAR : B/EXE/362.1/HARr : 362.11/EXE/HAR. Exeter. Eland. 1926. Publisher. Atkinson, C.T. The Devonshire Regiment 1914-1918. 1926. – Held by: Devon Heritage Centre: s356.11/DEV/ATK : 356.11/DEV/ATKr : 355.31/B/ATK : D355/ATK. Exeter. Eland. 1927. Publisher. Pugsley, Eli. Moorland verses. 1927. – Held by: Devon Heritage Centre: s821/PUG : sp821/PUG : 821/PHE. Exeter. Eland. 1970. Publisher. Braine, R.G . Dartmoor Forest. : Bellever Forest Walk. 1970. – Held by: Devon Heritage Centre: s634.9/DAR/FOR. Exeter. Eland. 1970. Publisher. Forestry Commission. Bellever Forest walk, Dartmoor Forest. n.d. – Held by: Devon Heritage Centre: 634.9/DAR/FOR.